Questus is leading the redesign of Universal Orlando's website, which is currently in development and on track to go live in late summer. In the meantime, we have been making transitional updates to their current site as we await the launch of the new UO.com. Shown is a refresh of the current home page and UX groundwork for two additional pages. Apple-centric treatment for digital utilities module. 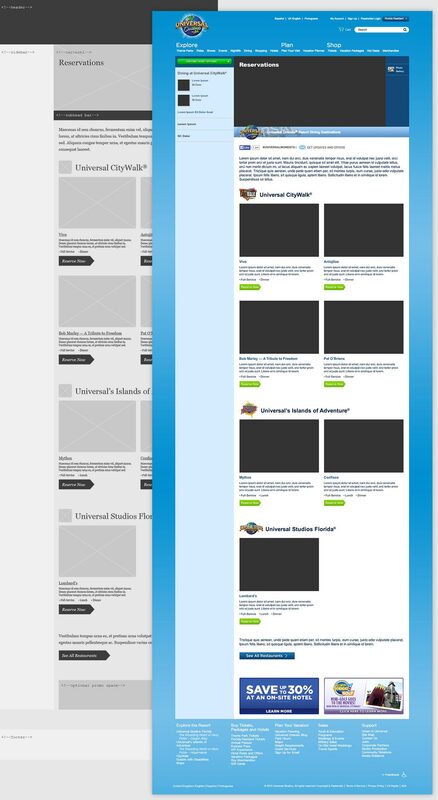 Wireframes and preliminary page layouts for two new additions to the current Universal Orlando website. I developed the wires based on the current site structure and built out visual design starter files for handoff.